204 High Park Avenue. J.T. Jackson House. From north corner. 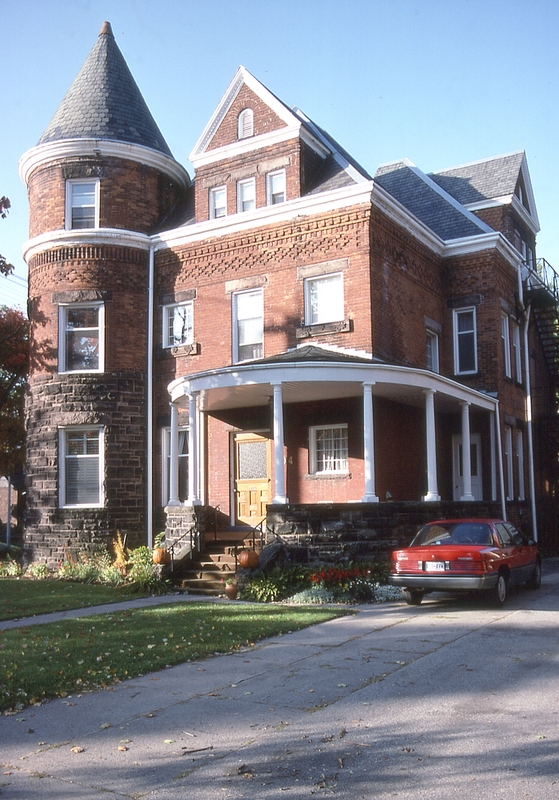 High Park Avenue was once home to some of the wealthiest and most important families in the Junction. Its tree lined boulevard reflects the “City Beautiful” movement of the late nineteenth century. 204 High Park Avenue was one of many grand Junction houses designed by Ellis, and is noted for its mixture of stone and red brick masonry. This house was designed for James T. Jackson in 1890, an early Junction real estate agent who co-founded the Junction’s first newspaper in 1888. Since 1973 it has been the home of Holy Cross Priory, an Anglican monastery. architectural style and use of materials is consistent with the Romanesque Revival being used throughout the city in the late 1880’s and early 1890’s yet the only use of a round headed opening is in the upper portion of the third floor gables, possibly as an attic vent. All other windows have stone sills and lintels.